You can do nothing anywhere. But it takes a special place to make doing nothing a real treat. My wife, Suzan, and I live in the mountains of northern Ecuador. It’s so easy to do nothing here that it’s almost a form of meditation. Take the weather. No snow, ever. No baking heat, ever. Shirt, shoes, a pair of jeans, a jacket, and a hat. That’s your wardrobe for the entire year. If it’s raining, which it occasionally does, get under a roof. If it’s windy, which it occasionally is, close the window. That’s it. The vast majority of the time, the weather here requires us to do nothing…not turn on an air conditioner, not turn on a heater, not even turn on a fan. Now take the expenses. We own our condo, and our property taxes here are about $55 per year. Per year. You can do nothing for a year and still end up with at least $55 in spare change in your pocket. Our monthly utility bills—electricity, water, internet, and bottled gas—average about the cost of one bottle of mediocre single-malt scotch. If I do nothing…i.e., if I don’t buy a bottle of mediocre single-malt scotch each month…I have my utility bills paid. And food. We can’t shop and cook for ourselves any less expensively than we can dine at most of the restaurants in our little town. There’s a $2.50 lunch up the street that includes soup, salad, meat, potatoes, dessert, and fresh fruit juice. 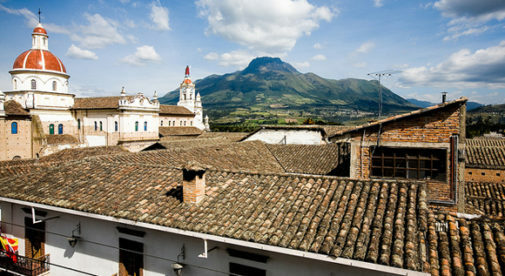 In the cool mountain town of Cotacachi, Ecuador, the pace of life is slow and steady. Stress is the last thing on people’s minds. On Tuesday evenings, a local bar serves a grilled hamburger and French fries for $3. Add a beer and this combo costs $5. Beer itself, in a local tienda, costs little more than a dollar for a 22-ounce bottle. We still cook for ourselves to keep our skills honed, but we actually save money by doing nothing ourselves in our own kitchen. And while we’re doing all this nothing, I find myself endlessly entertained by doing nothing but watching the light change during the course of the day as the sun plays across the nearby mountain slopes, farm fields, and eucalyptus groves. Don’t get me wrong…there’s still plenty to do here if we get the urge. 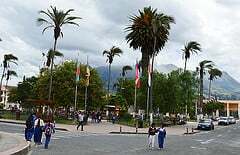 Our province is loaded with hiking trails, parks, lakes, hot springs, old haciendas, craft shops, open-air markets, jungle lodges, nature preserves, and the like. And we did have to do something to get here. We traveled around, did our research, and went through all the usual big ideas and big plans and big life changes. It seems now like it took a lot of work, study, self-assessment, and re-evaluating the “things” we thought meant a lot to us and gave meaning to our lives. It turns out that most of those “things,” most of those material things, anyway, were more of a burden than an advantage to us on our way to get to this place. We left a lot of them behind. Which again means that we do nothing about them. We do nothing about fueling and maintaining and insuring our car because we don’t have one. Don’t need one here…taxis and public transportation are cheap and plentiful. We do nothing about our huge cable or satellite TV bill because we don’t have one of those, either…we find everything we care to watch on the internet. We do nothing about running and maintaining our furnace because we don’t have one of those, either. Or an air conditioner. We even do nothing about cleaning the condo because our cleaning lady takes care of that every week for about as much as we’d spend on a bottle of serviceable cabernet wine. Which again means that, if we skip a bottle of serviceable cabernet each week, we don’t have to do much of anything to pay her. I wouldn’t exactly call ours a “do-nothing” lifestyle. But we sure don’t have to do much to enjoy it.